Mormons walk past the historic Mormon Salt Lake Temple as they attend the 182nd Annual General Conference of the Mormon Church on March 31 in Salt Lake City, Utah. SAN FRANCISCO -- If the Mormon church were a business, wealthy adherents like Mitt Romney would count as its dominant revenue stream. It would also likely attract corporate gadflies protesting a lack of transparency. 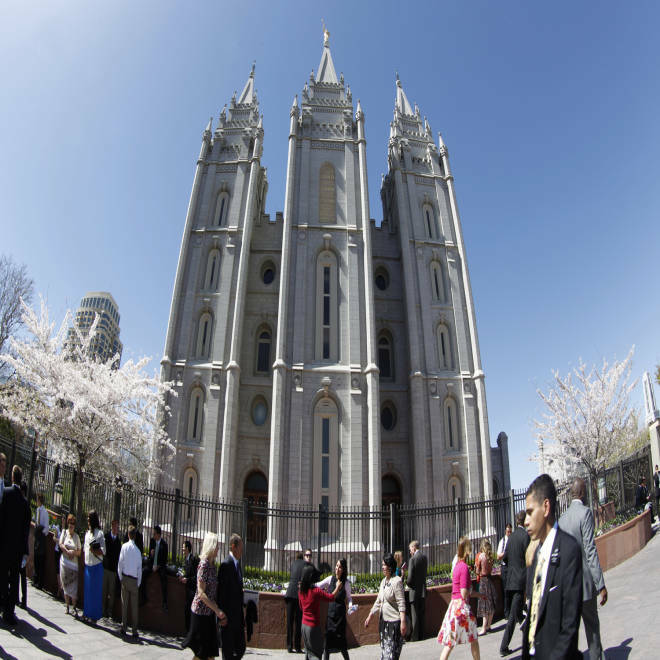 They would call for less spending on real estate and more on charitable causes to improve membership growth -- the Mormons' return on investment. Those are a few of the conclusions that can be drawn from an analysis of the church's finances by Reuters and University of Tampa sociologist Ryan Cragun. These active members are most likely to tithe, and the result is that from a financial standpoint at least, the church remains largely a venture of active American members, said Cragun, who adds that U.S. Mormon men tend to be wealthier than the average U.S. male. "Most of the revenue of the religion is from the U.S., and a large percentage comes from an elite cadre of wealthy donors, like Mitt Romney," said Cragun. "(It) is a religion that appeals to economically successful men by rewarding their financial acuity with respect and positions of prestige within the religion." The church is full of successful businessmen, including chemical billionaire Jon Huntsman Sr., the father of the former presidential candidate, J.W. "Bill" Marriott Jr. and his hotel-owning family, and even entertainer Donny Osmond. Romney, the Republican presidential candidate, gave $4.1 million to the church over the past two years (amounting to 9.7 percent of his gross adjusted income, according to the two years' worth of tax returns he has released). He would tithe on his IRA, valued at as much as $102 million, only when he withdraws from it and pays taxes. "Other projections are speculative and do not reflect an understanding of how the church uses its income to bless the lives of people," he added, saying the church was financed primarily from member tithing and offerings. It counts more than 55,000 in its missionary forces, primarily youths focused on converting new members but also seniors who volunteer for its nonprofits, such as the Polynesian Cultural Center, which bills itself as Hawaii's No. 1 tourist attraction, and for-profit businesses owned by the church. The church has plowed resources into a multi-billion-dollar global network of for-profit enterprises: it is the largest rancher in the United States, a church official told Nebraska's Lincoln Journal Star in 2004, with other ranches and farms in Mexico, Brazil, Argentina, Australia and Great Britain, according to financial documents reviewed by Reuters. It also has a small media empire, an investment fund, and is developing a mall across from its Salt Lake City headquarters, which it calls an attempt to help revitalize the city rather than to make money. These enterprises are also part of a vast nest egg for tough times. The church expects wars and natural disasters before Christ returns to Earth in the Second Coming, and members are encouraged to prepare by laying in stores of food. Farms and ranches are part of the church's own preparation. "The church teaches its members to live within their means and put a little money aside for life's unexpected events. As a church, we live by the same principle," Purdy said. The rainy-day fund and operating budget rarely mix, officials say. Those temples take a lot of money to operate, Purdy points out, and many of the grand church buildings are short on congregants, says David Stewart, a physician who leads the research group Cumorah. "I have been to beautiful church buildings in Hungary and Ukraine, and Latvia and other places, and there are these huge buildings and 35 people there, and you say, how can this work financially? The math - it just doesn't work." In contrast, the Seventh-day Adventist Church, which had about 17 million members a year ago, appears to be getting a better return on investment: It builds smaller meeting houses and lots of schools and hospitals, and its numbers are swelling faster than the Mormons', said Stewart. The Adventists claim a million new members join annually, compared with every three years or so for the Mormons. "The Seventh-day Adventists clearly have a much more expansive humanitarian project in terms of building hospitals and medical schools and schools and universities and long-term developmental infrastructure around the world," said Stewart. "It's paid off for them." The Mormon church, meanwhile, appears to be decreasing transparency and member control of donations. New tithing slips give fewer donation options and come with an expanded disclaimer saying the church has sole discretion over spending, even though it will make "reasonable efforts" to follow donors' wishes. "Hey, where's the slot of 'shopping malls'?" a poster said of the new slips on exmormonforums.com, one of several dissident sites. "The funds are used to build and maintain temples and meeting houses, as well as take care of the many expenses associated with helping the work of the Gospel of Jesus Christ roll forth. I love to pay tithing," Carl Ames said on one church site. Purdy did offer a list of spending priorities: building houses of worship, supporting Brigham Young University and a seminary system, operating nearly 140 temples and the world's largest genealogy research program, and humanitarian aid for both members and non-members. Since 1985 the church has spent a total of $1.4 billion on relief for disasters such as Japan's earthquake and Ethiopian famine, and it operates 129 "bishops' storehouses" with food and household items for the needy. Romney himself focuses on the act of giving, not the result. As he told Fox News Sunday, "Hopefully, as people look at various individuals running for president, they'd be pleased with someone who made a promise to God and kept that promise."